Weathering is when rocks and soil are worn down. Erosion is when the material that is worn down is carried away by wind, water, living beings or gravity. Deposition is when those materials stop moving and build up somewhere else. What is a delta, and how is it formed? When rain falls and snow melts the water flows downhill and forms a river. As the water is flowing, it picks up small pieces of dirt and rock, which is known as sediment. This sediment is what makes rivers look brown. When a river gets close to the ocean the land flattens out and the river slows down. When the river slows down the sediment begins falling to the bottom of the river. Over time the sediment builds up and new land is formed, which forces the river to flow in a different direction. The river spreads out and begins flowing in many different directions forming a triangular type shape. These sand dunes have moved over time. Sand dunes form when sand deposits. Dunes are constantly moving. 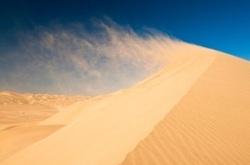 Check out this site on sand dunes to learn more.